"Remember Last Winter?" "FIGHT BACK WITH SCOUT!" Hoodie!! In 1979 we had one of the Wurst Winter Blizzards in recorded history, so in 1980 IH put out these special shirts to promote the Scouts role in helping rescue folks during that terrible storm. We can stack up to 2 Logos per sleeve!!! These are reproductions of those very collectable Hoodie! "Remember Last Winter?" "FIGHT BACK WITH SCOUT!" T-Shirt!! In 1979 we had one of the Worst Winter Blizzards in recorded history, so in 1980 IH put out these special shirts to promote the Scouts role in helping rescue folks during that terrible storm. These are reproductions of those very collectable Shirts! 100 Years of International SPECIAL POSTER! Limited Historical Commemortive Editon, Meduim SIZE POSTER!! Celebrating 100 Years of International Trucks - 1902-2002. This full color commemorative poster features pictures your favorite International made products from the beginning all the way up through 2002. Approx. size: 30" x 23"
Bright Multi-Color Designs on American made T-shirts, Jackets, & Sweatshirts. Designs can ordered and put on the front or back of a t-shirt (or both). T-shirts & Sweatshirts come in Ash Grey & Sizes Adult Small, Meduim, Large, XL, XXL, & XXXL. Designs also available on Jackets and Sweatshirts! 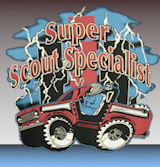 Description: 1979 & Down Scout II Decal (Custom) Reverse Color: Grey with Black trim! Description: 1979 & Down Scout Terra Decal (Custom) Reverse Color: Grey with Black trim!! 26th Annual Scout & Light Truck Nationals 2015 T-shirts Red! Small logo on the front, big logo on the back! EXTREMELY Limited number available!! While Supply lasts! 27th Annual Scout & Light Truck Nationals 2016 T-shirts Red! The following links will take to our Custom Build it for me Appearal Center!